Investiture of Thomas P. Sculco, M.D. Out of the hundreds of portraits Stony Brook alum Ying-He Liu has painted, one holds a special significance. In May 2009, Liu was contracted by the Stony Brook Foundation to paint the portrait of then departing President Shirley Strum Kenny. On November 12, the painting was unveiled before the University community, marking the end of just one of many projects for Liu. But more than just the brushstrokes went into the 46’’ by 42’’ portrait of the Texas native that will soon be hoisted in the lobby of the Melville Library. It was a life’s work and respect for art that got Liu to paint President Kenny’s portrait. One of the most difficult times in Liu’s life was living through the Chinese Cultural Revolution. Liu was 16 when she, along with thousands of Chinese youth, were forced out of their homes and relocated to work in the fields of rural China as part of Chairman Mao’s re-education program. She was subject to heavy labor, long hours and poor nutrition for the two years she spent working on a farm. Early on, Liu lived a privileged childhood. Her parents were well-accomplished scientists in China and provided her a rich education in Shanghai. But when Mao’s cultural revolution took off and reinforced communist rule, Liu’s family was one of the first targeted, and so she left, forcibly, for the fields. Because Liu’s parents exposed her to different forms of fine art, from playing piano to training with profiled artists, she was recruited to work off of the farm and in a local theater. It was here that she taught herself English by reading books during the free time she had. The theater was nowhere near as labor intensive as the farm, she said. Liu wound up at Stony Brook with the help of their uncle, a professor at Harvard. Her mother, who had found work as a biochemist at the University of Massachusetts, could not afford to pay for all three of her children, Liu’s brother and sister included, to go to a private college. So Liu came to Stony Brook because of its affordable price. While her siblings pursued degrees in medicine and engineering, Liu wanted to become an artist. She was the only one out of her large family who did not pursue the science route. During the early ‘80s, Liu’s preferred genre, realism, was overshadowed by the growing styles of modernism and contemporary art. It was under the direction of former Stony Brook Fine Arts Director and current Professor Emeritus Mel Pekarsky that Liu was able to refine her craft before graduating in 1981. But even then, there was little refining to be done. After graduating from SBU in 1983, Liu spent a year taking classes in the School of Visual Arts before taking the next few years to compile a portfolio she planned to show to potential employers and exhibit in art galleries in the city. She acknowledged that none of this would’ve happened if it were not the support of her husband, Dr. John Hui, a former professor in the Department of Surgery who she met at Stony Brook. Liu would get her big break in 1986, where she was represented by Portraits Inc, a prestigious world-renowned gallery in New York; she had also become an American citizen. Shortly after, Liu would devote her time to doing what she truly enjoyed, painting portraits. “Ever since I was a young child, I was always interested in drawing people and faces,” said the 58- year-old Liu, who paints the majority of her portraits in the living room of her East Setauket home. Her supplies and projects mostly take up the rest of the house, her husband jokes. Unfinished portraits of doctors, professors and children line up along her living room hall. Depending on the size of the portrait, age of the subject and amount of supplies used, the gallery published price of Liu’s portraits can range from $10,000 to as high as $35,000. And despite the current economic downturn, her living room and studio on the second floor is evidence that her own personal business hasn’t suffered. When Liu went to photograph Kenny for the portrait, the two were unhappy with a few minor details with the photo, specifically Kenny’s hairstyle. It was after the second shoot, which took a little more than 45 minutes out of the president’s schedule that they were happy with the result. Liu had gone one last time to the president’s office to capture the one feature that makes Kenny’s portrait different from most other traditional portrait paintings: the campus. “She did so much for the university in transforming the overall look,” said Liu, who recalled the unaesthetic campus she was used to when she was undergraduate. “The view from her office was great and we wanted to incorporate that,” she said. A portrait of Sweet Briar’s ninth president, Elisabeth Showalter Muhlenfeld, was unveiled Friday, Nov. 7 at Mary Helen Cochran Library, continuing a tradition that has been in place since the College’s founding in 1901. 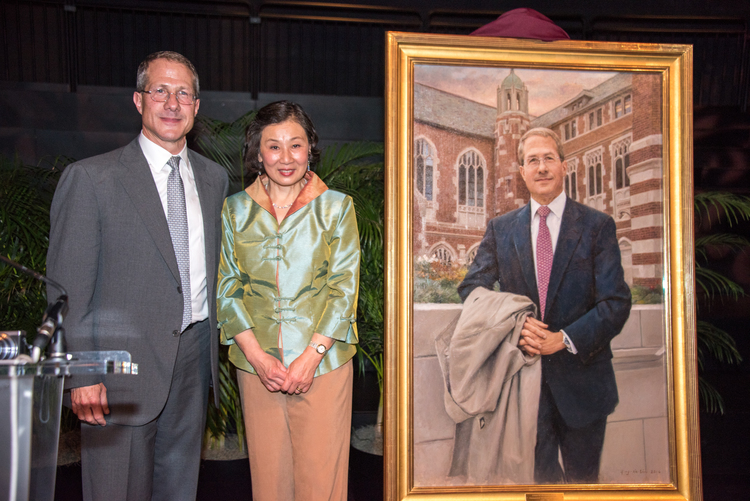 President Muhlenfeld (right) poses with artist Ying-he Liu (left) and the presidential portrait. 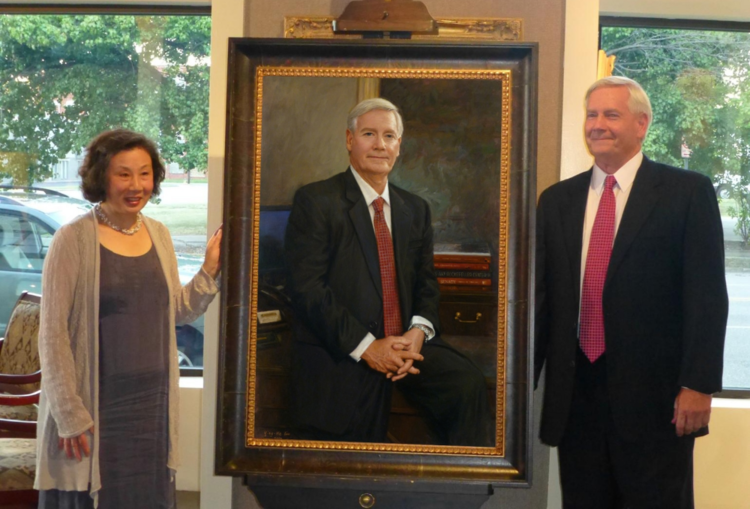 Although Muhlenfeld will not retire until July 2009, her portrait – painted by New York artist Ying-he Liu – already hangs in the library’s main hall alongside renderings of the College’s previous eight presidents. Liu grew up in China amid that country’s tumultuous Cultural Revolution and immigrated to the United States in 1981. 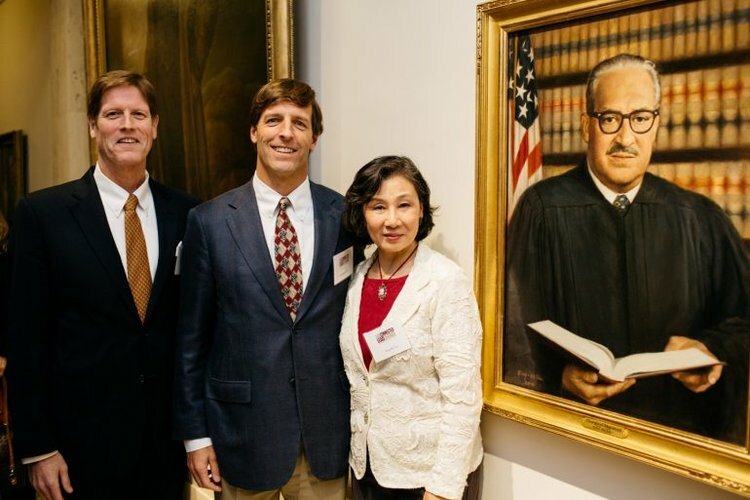 In her remarks, Liu said she was grateful for the opportunity to paint Muhlenfeld’s portrait – not only because it was a “rare and huge honor” and a “big break” in her career, but also because of what it meant to her as a mother. “A woman artist painting a woman president of a women’s college – such an affirmation of what women can achieve in this country and in today’s world,” she said. “As a mother of a teenage daughter, this commission has special significance to me on a personal level. It sets a great example to my daughter. “I understand that major renovation work of this iconic building took place under Betsy’s leadership. … What I tried to convey in this painting is a sense of Betsy’s pride and love of this magnificent academic institution,” Liu said. Liu has a fine arts degree from the State University of New York at Stony Brook and also studied at the School of Visual Arts in New York City. Her portraits can be found in the collections of many universities, colleges, corporations, hospitals and private residences. Muhlenfeld’s portrait was underwritten by generous donations from the following people: Catherine Barnett Brown ’49 and her husband, Walter, who is an honorary member of the Class of 1949; Sara Finnegan Lycett ’61; Margaret Sheffield Martin ’48; Norma Patteson Mills ’60 and her husband, Olan; and Allison Stemmons Simon ’63. Ying-He Liu was born in Shanghai, China, majored in fine arts at Stony Brook University, in Stony Brook, New York, and pursued graduate study in illustration at the School of Visual Arts, in New York City. She became an American citizen in 1986. Her portraits are included in the collections of the Alvin Ailey American Dance Theatre, in New York City; the Children’s Hospital Boston; the Kemper Museum of Contemporary Art, in Kansas City, Missouri; Washington University, in St. Louis; and the Groton School, in Groton, Massachusetts.